After completing my second round of Whole30, and successfully avoiding sweets & treats of any kind for thirty days, it feels good to be back with a new Paleo dessert recipe! This one started off as a new cookie recipe I wanted to test out during one of my "Sunday recipe testing" days. I soon realized, however, that the cookie "dough" I had whipped up was just not firm enough to scoop into cookies that would hold a good shape. So, I changed plans and decided to turn it into a giant cookie. My inspiration was the much loved "pizookie" from BJ's Restaurant & Brewhouse. 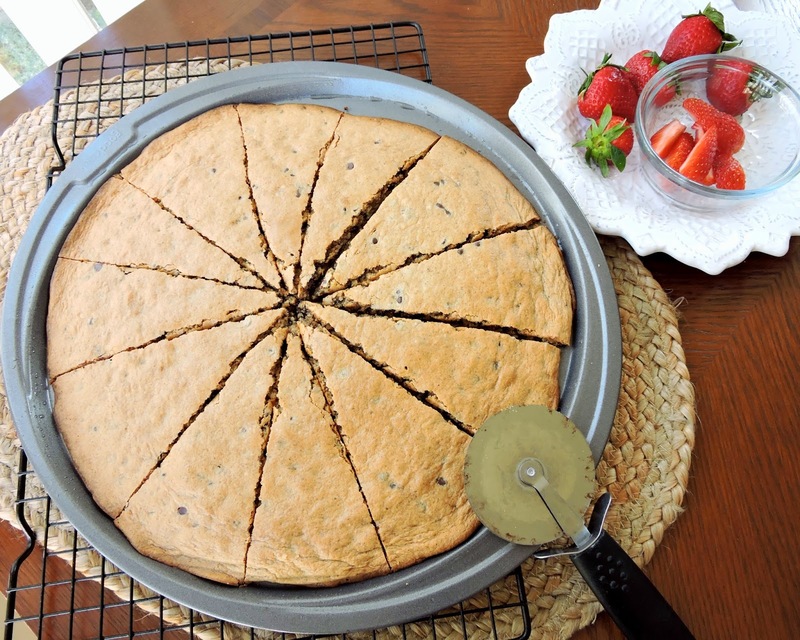 If you haven't had one before, it's basically a giant, warm, deliciously gooey chocolate chip cookie baked in a pizza dish & made for sharing. 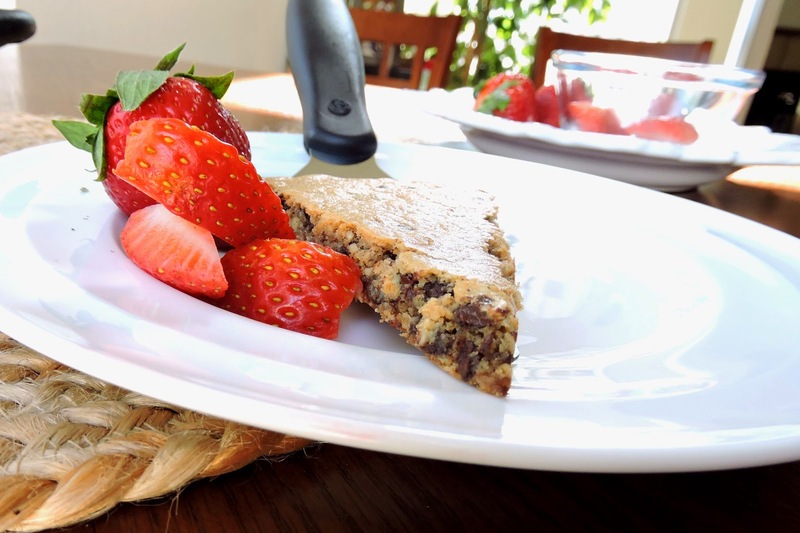 I thought this could be a Paleo answer to that famous dessert- and it worked out perfectly! 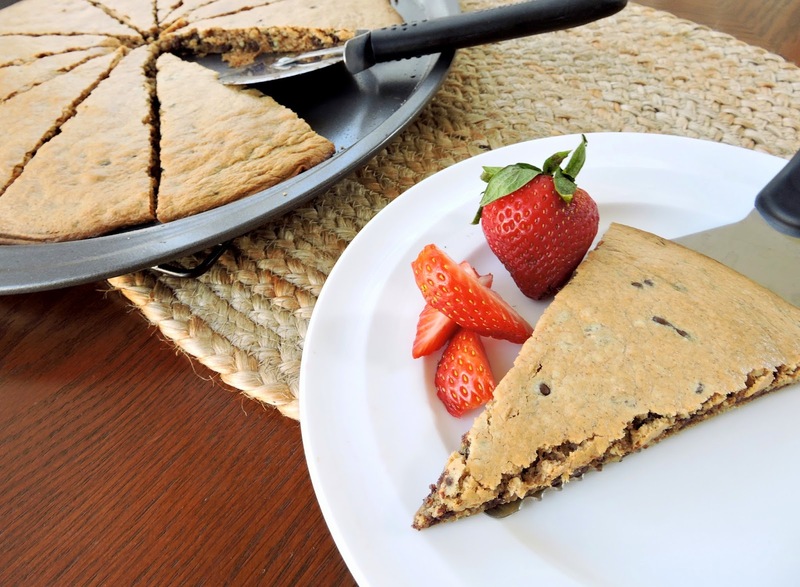 The texture is that of the perfect chocolate chip cookie. Crisp on the edges, but soft & chewy in the center. The best part is that when you slice it like a pizza, you can actually hold up a slice without it breaking in half or crumbling to bits. The ingredients are really simple, and the outcome is awesome! I think this would be perfect for any gathering, date night in, or a birthday celebration. 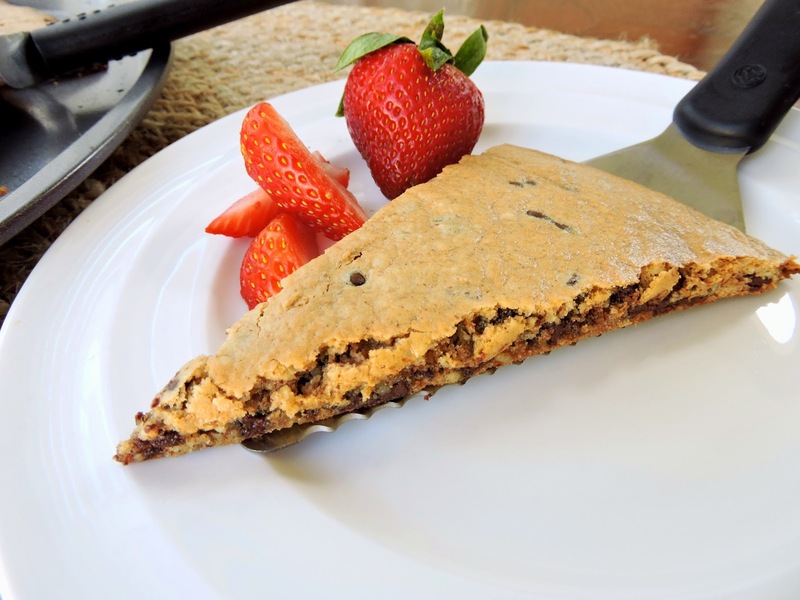 You could also scoop this cookie dough "batter" into smaller single-serving pie dishes to make baby pizookies...! Top with fruit or dairy-free ice cream, and serve it warm... & you are in for a treat! Hope you enjoy! Combine all of the ingredients in a large bowl, stirring in the chocolate chips last. Grease a cookie sheet, pie dish, or pizza pan (I used a 12" nonstick pizza pan) with fat of your choice so the cookie won't stick. Spread your cookie dough out, leaving about 2 inches of pan around the circumference for the cookie to spread. Don't worry about leaving space if you're using a pie dish & going for a "deep dish" sort of pizookie. Bake for 14-16 minutes, or until the cookie is golden brown around the edges and "set" in the middle (no longer jiggles if you shake the pan). Allow to cool, and slice with a pizza slicer into equal sized pieces. I stored my leftovers in the fridge & heated in the microwave for a few seconds to serve it warm! Try it topped with a dairy-free ice cream, fruit, or chocolate drizzle. Congrats on completing your whole30!! This recipe looks to die for. could use a different nut butter... like cashew? i am allergic to almonds! thanks!